Credit is important. It’s something you need to have if you want to ever own a house or buy a brand new car. Even having no credit can affect your ability to do these things. And bad credit is the worst thing to have when you want to chase the American dream. Even if you already have bad credit and a low credit score, you can fix your credit. You might not be able to fix it overnight, but if you get started right away you can make quick progress. If you aren’t sure how to do it, here are some tips. Your bad credit may be out of your control so it would be helpful to have someone on your side that can help you get it back under control. Consider hiring a credit repair company that can help you consolidate your bills to make payments easier. Take a little time to research the companies you consider to find one that will really help you get your debt under control. You can help yourself stay out of debt and keep your credit score higher if you’re always making payments on time. Make more than minimum payments on credit cards to help take care of your balance faster and keep your interest payments lower. You should also be paying your utility bills on time and in full. Don’t let them get to the point where they require you to sign up for a payment plan if you don’t want to get shut off. It’s a very slippery slope from late bills to collection agency calls. If you can afford it (and if you can’t then having credit cards in the first place may have been a bad idea for you) you should keep your credit cards at zero balances. This is a great boost to your credit score, and it could also lead to credit card limit increases if that’s something you’re into. Try to learn to only use your credit for an emergency, or in times when you could be getting cash back or some other reward. Instead, use cash or debit every chance you get, which won’t affect your credit, good or bad. 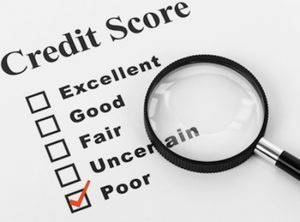 Applying for new credit cards can mess with your credit rating as well, especially if you are applying to many at a time. This “inquiry” that goes through to the credit bureau may even be bringing down your credit score. If you want a new credit card do some research to find one that you are sure will approve you before you apply. Research your current credit score, and be aware of the stipulations that card has for people they accept. If they deny you, wait a few weeks to apply for another one.